I'm so excited to finally talk about the Cash Envelope System! I am such a fan of this simple, tried-and-true method, and I can't wait to tell you how we've made it work for us. 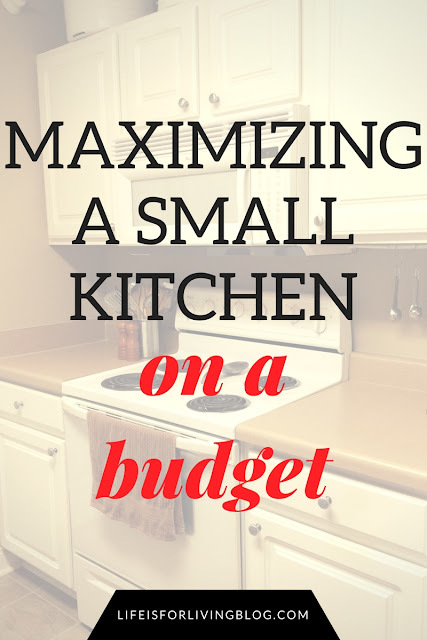 If you haven't read my post about making a budget, you should check that out before you continue, because I'm going to be making references to it throughout this discussion. From these experiences, I've seen firsthand that this plan works. It really, really works. But only if you have the willpower to restrain yourself and follow the rules exactly. If you do those things, I promise you the long-term reward will be completely worth it. The first thing to understand here is that the Cash Envelope System is a cash-only system. If you currently have debt and your aim is to be debt free, you cannot continue to accumulate debt as you attempt to dig yourself out of the hole. You would only be working against yourself if you did this, preventing yourself from ever making a dent in your debt balance. The easiest way to keep from doing this is to remove all temptation to swipe the plastic. 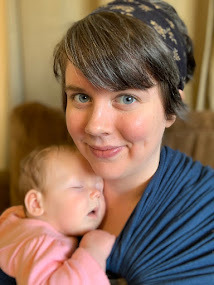 After Matt and I calculated our debt balance and decided to take control of our finances, we locked our credit cards in a fire-proof safe, which is tucked away out of sight in our home. It makes it pretty darn hard to pull out the Chase card at the Walmart checkout when it's locked up in a safe on the other side of town. When the cash in your wallet is your only option, you're forced to stay on budget. Now, you don't have to use a safe. You could hide your Citi card in your sock drawer. We just picked the safe because it's so much trouble to find the key, go to the safe, and dig through it to find the card that, by the time we do all those steps, we'll have pondered whether or not we should really be getting it out in the first place (yay for reducing our chance of making impulsive decisions!). The same rule generally goes for debit cards, though I do carry mine in my wallet to use for gas and legitimate emergencies (which is not finding a ceramic owl statue for 75% off). I don't like to go inside gas stations to pay cash, so I just pay with my debit at the pump and keep track of how much of our designated gas money is left in our checking account. I'm not tempted to use it for other purchases when I run out of cash because I A) know how grim our checking account balance is, and B) have a strong enough fear of over-drafting. But, if you think you might be tempted to use your debit card when you shouldn't, lock it up with the credit cards. Or at least leave it hidden in your locked car before you go into the supermarket. After you've made your budget and determined the total amount of cash you'll need to cover all of your adjustable expense categories (i.e., groceries, clothing, fun, etc. ), head to the bank and either write yourself a check or hit up the ATM. I've actually had a couple of hiccups with this step. First of all, to cover our categories for the month, we need to withdraw well over $500. Our bank has a $300 maximum ATM withdrawal per day. So, we either have to write a $500+ check to ourselves and deal with a teller to cash it (such a pain, having to talk to people and everything) or withdraw part of our cash at the ATM one day and the rest another. To keep from using checks (and making social contact), we just go to the ATM twice, on separate days, at the beginning of the month. Another issue we've had that you may be wondering about is not having enough cash in our account at the beginning of the month to cover all our expenses for the entire month. This was a problem when Matt got paid on a bi-weekly basis, as opposed to a monthly basis as he does now. This sounds like a common issue, since most people get paid either bi-weekly or weekly. But it's not a big deal. If you get paid on a bi-weekly schedule, simply cut your monthly budget in half and get your cash twice a month, depending on when you get paid. It will require a little more work because you'll have to do all of these steps more than once each month, but once you get the hang of it, it's seriously no biggie. I like this step. I'm not sure if it's because it makes me feel rich to see all of my money stacked up at once, or if I just like organizing things. Probably both. Anyway, if you're going to do this the old-fashioned way, you'll need to get out a few basic envelopes and a pen (or, if you have OCD tendencies like me, a variety of colored Sharpies to color-code your categories). Label one envelope for each category that you've created in your budget. Now divide that fat stack of cash among your new envelopes according to your budget. If you want to spend $40 on dining out, put $40 in the envelope labeled "Dining Out". Pretty straightforward. Once you've filled your envelopes, you're ready to shop. Just place your envelopes in your purse or wallet and go. When the cash runs out, so does the fun spending. That's the old-fashioned, cheap-and-easy way. However, I perfected this method after getting tired of having to replace my envelopes every month (and getting embarrassed at the checkout when I shuffled through my many frayed envelopes of cash in front of an often annoyed and/or judgmental cashier). I got this coupon wallet with labeled tabs! 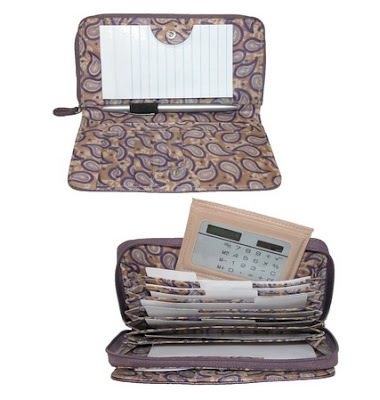 You could always just go to the Dollar Tree and get one of their plastic expanding coupon organizers, but I wanted something that would 1) fit comfortably inside my smallish purse, 2) neatly hold my drivers' license, insurance cards, debit card, and all my frequent shopper cards and junk, and 3) look enough like a normal wallet to prevent embarrassment when I checkout somewhere (I know that's lame. But still.). This wallet does all of these things quite well, so I definitely recommend it. There are also some SUPER CUTE handmade cash envelope wallets on Etsy if you have the extra dough to go that route (but if you're needing to put this plan into motion, you probably don't, so...yeah. Don't use your credit card to get a cute wallet for this, okay?!). Anyway. 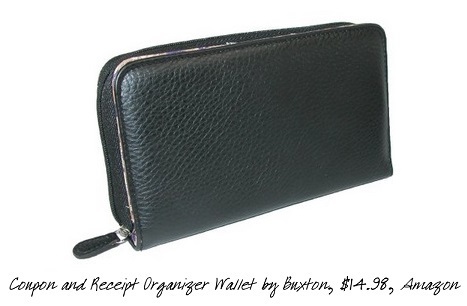 Here's how I organize my money each month with my wallet. Before I go to the ATM, I write down how much I need for the month on an index card (sometimes I forget). I also list how much of that total goes into each category, as well as how much I'm leaving in my checking account for gas. 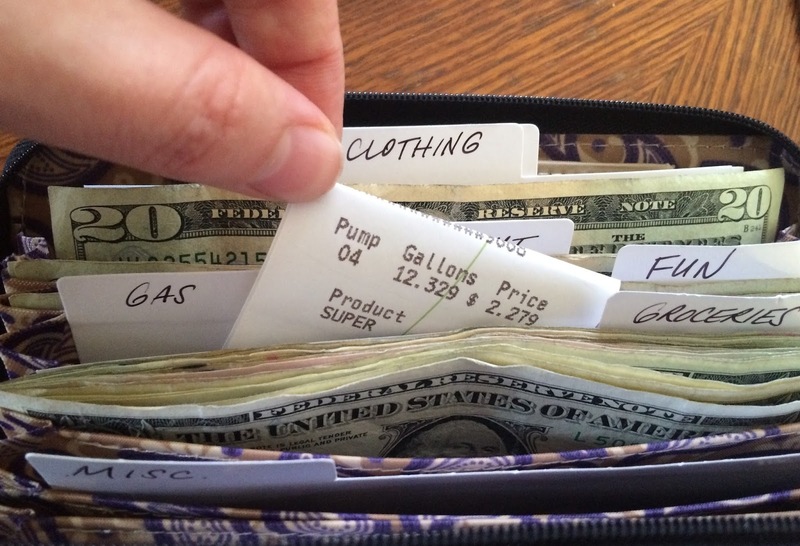 Then, I remove my cute little wallet tabs, which I neatly labeled to correspond with my budget spreadsheet, and I divide and place the cash on top of them. Then they go back into the wallet. To make sure we're on track with our debit card gas purchases, I just keep our receipts in the gas tab where the cash would normally be. If you're using actual envelopes and would rather use your debit card for gas, just set aside an envelope for your service station receipts and carry it with your others. This step is technically optional, but I highly recommend it. If you want to keep up with how well you're staying on budget, you can always just count the cash remaining in your envelopes/wallet tabs. I mean, it'll be pretty obvious when you spent too much. You'll definitely notice when your cash starts depleting (which is why this method is so effective; you don't see this and feel the sting of loss when you painlessly swipe a credit card). But if you want to keep an extra close eye on exactly where your money is going, save your receipts and keep a spending log. You can do this with a notebook, but of course, I'm going to show you how we do it with Excel. Every time you make a purchase, immediately put the receipt back into the envelope/tab from which you pulled the cash. When you get home, use the receipt to record the purchase. Or if daily updates are too much for your schedule, save your receipts and enter them once a week. Like I said, you don't have to do this step to follow the Cash Envelope System. However, this additional step requires you to stop and truly see how much you're spending, how much you have left to spend, and where you may need to adjust category amounts. It was a real eye-opener this week when we saw, after entering our receipt information into Excel, that we'd gone $80 over our $90/week grocery budget...only one week into the month. Being aware of this will enable us to plan better for next week's shopping excursion. 1. When the cash in one envelope/wallet tab runs out, that's it. No more spending. You make do with what you have. 3. Resist temptation to pull out the plastic. You have to be a responsible adult who lives within your means. No more using other people's money to cover your expenses. You can do this. 4. Stick with it and be patient. Don't worry if the first couple of months aren't perfect. It'll probably take a few months to get the hang of things. Now, I want to add a little bonus to this method. If you (by some miracle) have any leftover cash at the end of the month, you have a few options. For instance, let's say I have a $40 clothing budget but in July, I only spent $20. I have an extra $20 in my wallet that needs to go somewhere. For August, I can either A) roll this $20 over to the usual $40, giving me a cushy $60 budget for August, B) rollover the $20 to the August budget and withdraw only $20 at the ATM to keep my usual $40 for August, which would give me an extra $20 out August's paycheck to pay toward debt, or (my favorite) C) put the $20 into a savings envelope. We just came up with this idea last week and are anxious to put it into motion. This is different from a regular savings account. This is tangible; you can see and feel the money adding up. It's wonderful. There are several "big things" we want to buy that don't fit into any of our budget categories, and they're not essential enough to dip into our bank savings. So, to save up for these things, we created envelopes. And, because I felt crafty at one point, a road trip jar. I really want a bike, and Matt really wants a table saw, so we thought we'd start there. And of course, we're always wanting to go on road trips, so that's just a given. At the end of the month, if we have any cash leftover, we'll distribute it into these funds as evenly as we can. Actually, this is how I paid for my share of the wedding. I think I've mentioned on here before that, despite all of our debt, none of it is from the wedding (Woohoo!). I saved up leftover adjustable expenses cash in an envelope labeled Wedding, and it led me to a debt-free ceremony and reception! I don't know how long it will realistically take us to save up enough for a bike, a table saw, or a road trip, but hey, at least we're saving. What are your thoughts on this system? Have you tried it? How have you made it work for you? 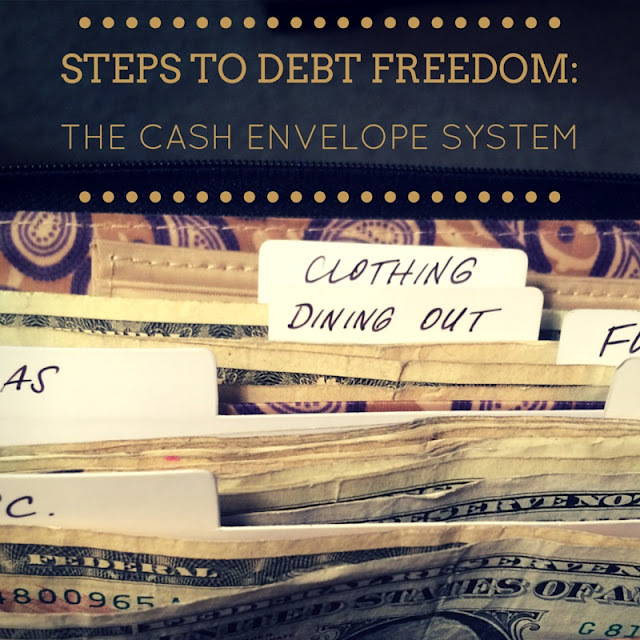 I'm glad you made this post so I could learn a little bit more about the whole cash envelope system. I want to try this...maybe after I get home from MO. Haha. My credit card debt is getting real. Nice! It's cool to read about this in such detail. When I got my first job at the ripe young age of 19, I was so paranoid about falling into my parents footsteps of racking up debt (some of it was out of their control but I saw how badly the debt influenced their life), I was determined not to fall into that as well. So I did the cash envelope system and stuck with it pretty well. DEFINITELY my favorite part, like you, was taking my extra cash at the end of the month and putting it into my savings account! Haha, I loved that. I found myself making a lot of my purchases online, and I would often forget to bring my cash envelope with me or accidentally leave it in the car. I also became increasingly paranoid that it would get stolen and there's very little chance of getting stolen cash back. At least with a debit card I could have it cancelled right away. So I made the switch to a sort of virtual cash envelope system. I keep a running tally of every expense I make in each category in my handy Excel spreadsheet and update it weekly so I know how much is in each category. Then I just use my debit card. I haven't gotten into too much trouble with this method until I moved out. Moving out brought a lot more expenses and transactions to make, so I've gotten into the bad habit of neglecting my spreadsheet and not updating it as often as I should. I've been OK for the most part but I have "over drawn" from categories a few times because I didn't have a realistic idea of what I had left. I think groceries are the trickiest for me -- I feel like I spend so much on food, yet I always over spend by $20 or $30 each month anyway. Ugh! I want to get back on track and your posts have given me some good ideas! Thanks again for the tips and best of luck to you in your debt free journey. House Update: We Have Furniture!